AGILO, a monk at St. Aper in Toul who was invited by St. Gerard of Brogne (3rd October) to restore monastic discipline at Sithin Abbey (later St. Bertin’s Abbey) in present-day Saint-Omer, France. St. Agilo reposed 957. CAESARIUS of ARLES, born in Châlon-sur-Saône in Burgundy, he received monastic tonsure at Lérins when young, and was consecrated Bishop of Arles circa 502, ruling for forty years. He has been called one of one of the greatest prelates of his generation; second only to St. Gregory the Dialogist (3rd September) and St. Gregory of Tours (17th November). 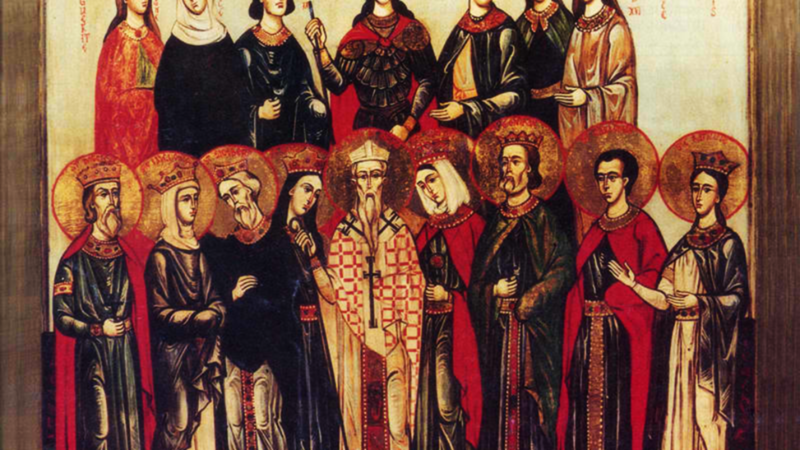 St. Caesarius presided over the Councils Agde (506) of Orange (529); was the founder of a monastery for women in Arles, which his sister St. Caesaria (12th January) became abbess; and was one of the foremost preachers of his day. We are fortunate that over 250 of his sermons are still extant. St. Caesarius reposed 543. DECUMAN (DAGAN), St. Decuman is remembered as a Welshman who lived as a hermit in present day Watchet, Somerset, England. There the church of St. Decuman is located at the place where he is believed to have been martyred (circa 716). Unfortunately, there are no reliable facts of his life extant, and the few details that remain are based upon local tradition and legend. EBBO, after receiving his education at the monastery of Saint-Pierre-le-Vif in Sens, St. Ebbo succeeded his father as Count of Tonnerre. However, he returned to Saint-Pierre-le-Vif at some point and received monastic tonsure, and in 704 was elected Abbot. St. Ebbo was consecrated Archbishop of Sens (circa 709), providing a great deal of support to his flock during the Siege of Sens by Saracens in 725. St. Ebbo reposed in 740. ETHERIUS (ÆTHERIUS ALERMIUS), Bishop of Lyons from 588 until his repose 602. It is possible St. Etherius consecrated St. Augustine the Apostle of England (27th May) to the episcopate. EUTHALIA, (Third Century), according to tradition St. Euthalia was a virgin martyred at Leontini in Sicily. She and her mother had converted to Christianity, but her pagan family is said to have disapproved, and her brother flew into a violent rage and beheaded her. It should be noted that the Bolandists are of the opinion that she may very well be apocryphal. GEBHARD, the sixth Bishop of Constance in Germany, from 979 until his repose 995. He was the founder of the imperial abbey of Petershausen in present-day Konstanz in Baden-Württemberg, Germany. JOHN, Bishop of Pavia in Lombardy from 801 until his repose 813. No further details of his life are extant. LIBERIUS the CONFESSOR, elected Pope of Rome 17th May, 352, St. Liberius was an unwavering defender of Orthodoxy against the Arian heresy, and an ardent defender of St. Athanasias of Alexandria. These positions led to his imprisonment by order of the Emperor Constantius (r. 337-361), however the protests of his flock in Rome, soon led to his release. Unfortunately, his release came with the condition that St. Liberius attend the Semi-Arian Council of Sirmium (357), where he was forced to sign the Acts of the Council, which came to be known as the Blasphemy of Sirmium. St. Liberius returned to Rome, where he spent the rest of his life repenting for signing the Acts, and working to strengthen Orthodox Christianity. St. Liberius reposed peacefully on 24th September, 366. An interesting detail about St. Liberius is that he was never recognised as a saint in the Roman Patriarchate, and is the only Pope who is an Orthodox saint, but not recognised as such in the Roman Catholic Church or any other Western confession. LICERIUS (LIZIER), though the Roman Martyrology lists him as a Bishop of Ilerda in Spain, it is more likely he was actually Bishop of Couserans in the south of France. It has also been conjectured that he is actually Glycerius, Bishop of Couserans in the late fifth, early sixth century. MALRUBIUS, not to be confused with the St. Maelrubius whose feast is 21st April, this saint lived as an anchorite in present-day Kincardineshire in Scotland. During the Viking invasions, St. Malrubius abandoned the life of a hermit to give aid to his oppressed countrymen and attempt to enlighten the invaders. His good works resulted in his martyrdom at the hands of the Vikings circa 1040. NARNUS (NARNO), (Date Unknown), the first Bishop of Bergamo in Lombardy. According to tradition he was consecrated bishop by the Apostle Barnabas, though it is more likely St. Narnus lived in the fourth century. 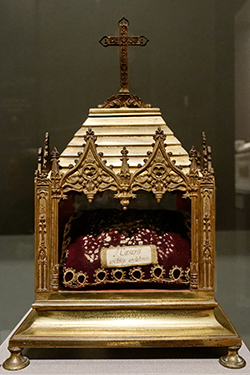 His relics are enshrined at the Duomo di Bergamo, Cattedrale di Sant'Alessandro in Bergamo. RUFUS and CARPOPHORUS (CARPONE), (Third Century), the Roman Martyrology lists two martyrs by the name of Rufus. One, who is also listed in the Martyrologium Hieronymianum as Rufinus; and a Bishop of Capua. And this one said to have suffered, along with Carponius, a companion, during the persecutions of Diocletian. RUFUS of CAPUA (First Century), the Roman Martyrology lists two martyrs by the name of Rufus. One, who is also listed in the Martyrologium Hieronymianum as Rufinus; and the other being said to have suffered, along with Carponius, a companion, during the persecutions of Diocletian. This St. Rufus, is said to have been sent St. Apollinaris of Ravenna (23rd July) to serve as a Bishop of Capua, and was most likely a martyr. SYAGRIUS (SIACRE), Bishop of Autun from circa 560 until his repose in 600. He accompanied Gontram to the baptism of Clotaire II at Nanterre and hosted St. Augustine of Canterbury (27th May) when he passed through Autun as he travelled to England. It was during St. Syagrius’ time as bishop, that Pope St. Gregory the Dialogist (3rd September), decreed that the Bishops of Autun were second in precedence to the Archbishops of Lyons.